Pillows make our bed a cuddly feel-good oasis. Gently they bed us in a cosy environment and accompany us to the land of dreams every night. To create a comfortable atmosphere und fulfill all ergonomic and functional requirements, these are the demands we make on our [:SchlafKult:]® pillows. A combination of traditional materials und new, high-tech materials allow us, to do this balance act successfully. Our pillows therefore convince through their skin-friendly textile layers, the cosy-soft feeling of lying, a long life cycle and easy handling and care – washing programms with up to 60° C in average household washing machines are absolutely trouble-free for most of our pillows. “Normal” pillows cannot always fulfill all the ergonomic demands. Especially for people sleeping in a position on their stomach or side sleepers problems based on too little supporting power can occure. 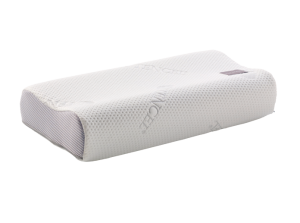 To find a remedy, especially designed neck support pillows can help with their extra high supporting power to relieve the pressure from the spinal column.